Maserati's lowest-priced and most accessible car ever, the 2014 Ghibli, has completed its IIHS safety testing and received a 2013 Top Safety Pick designation. The tests complete all of the requirements for the all-new Ghibli to begin deliveries to lucky buyers in the United States. The 2014 Maserati Ghibli is priced as low as $65,000 and is rolling into showrooms around the country as Maserati expands its retail network to boost sales for the often-traded Italian motorcar maker. The Ghibli's Ferrari-made V6 and its 404 horsepower propel the car through an eight-speed automatic transmission to the rear wheels or (optionally) all four. In a coupe-like, four-door sedan design, the luxury sport sedan retains its Italian thoroughbred nature while its four year/50,000 mile warranty, road-side assistance, and loaner car service as part of the purchase package show that it's not just an exclusive car, but also one sold with top-tier service and reliability. "The all-new 2014 Maserati Ghibli represents a break from the ordinary in the mid-size sedan segment," said Peter Grady, Maserati North America, Inc.'s President and Chief Executive Officer. 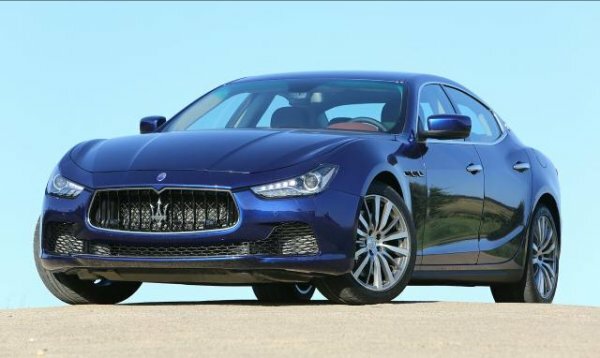 "Luxury sport sedan drivers can now enjoy the style and performance expected of a Maserati, and the assurance of its status as a 2013 IIHS Top Safety Safety Pick." The new Top Safety Pick designation, Maserati says, proves that a car can be sporty, affordable, exclusive, practical, and safe all at once. The 2014 Ghibli is in showrooms now.